13:00 IST, 18 Dec: The editorials uploaded here. 07:20 IST, 9th Dec: There was an error in the statement of EBAIT, and we are working on rejudging the problem so that this version also gets AC. We will announce about further steps in a while. 00:50 IST, 9th Dec: The SnackDown 2019 - Online Elimination Round has ended! The final list of users who will qualify for the Onsite Final will be finalized after plagiarism checks are done. Emails will be sent to all qualifying teams. 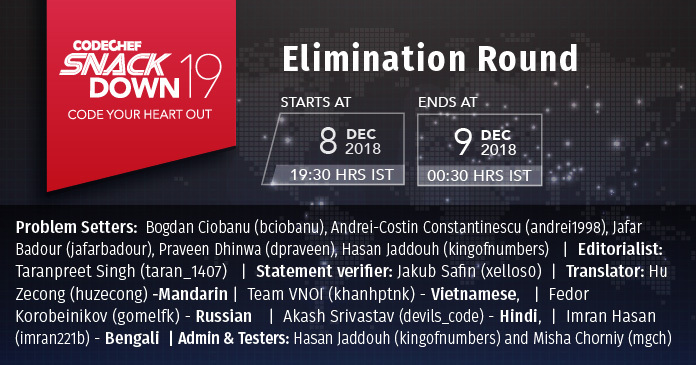 03:24 IST, 5th Dec: All the shortlisted teams (top 500 ranks and various reserved categories) for Online Elimination Round can be found here. Teams which have qualified through the top 500 ranks category will still be considered for any relevant reserved categories while selecting teams for the onsite. 12:13 IST, 5th Nov: The SnackDown 2019 - Onsite Finale will be conducted on 15th and 16th February 2019 in India. The venue for the onsite will be announced soon.